Say Aloha to our Hawaii Holiday Experts | Advise and tips from their trip! 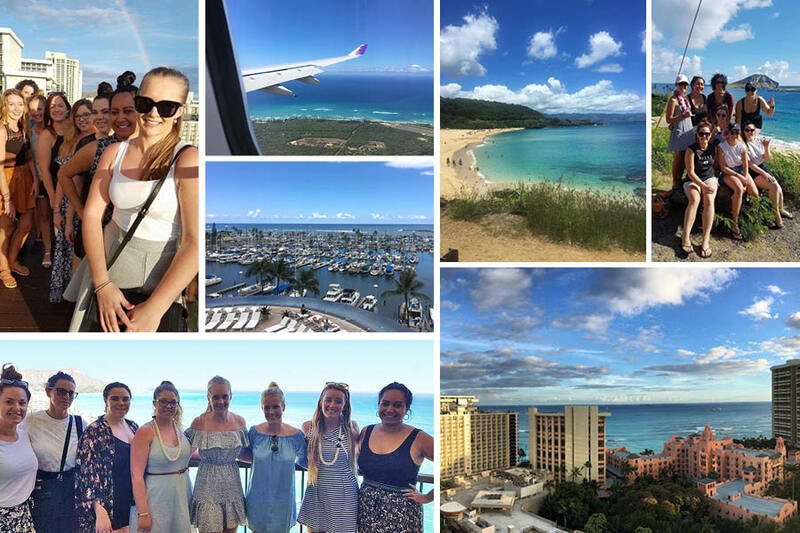 Recently our friendly team of Hawaii Holiday Experts took a trip to their all-time favourite destination, Hawaii! 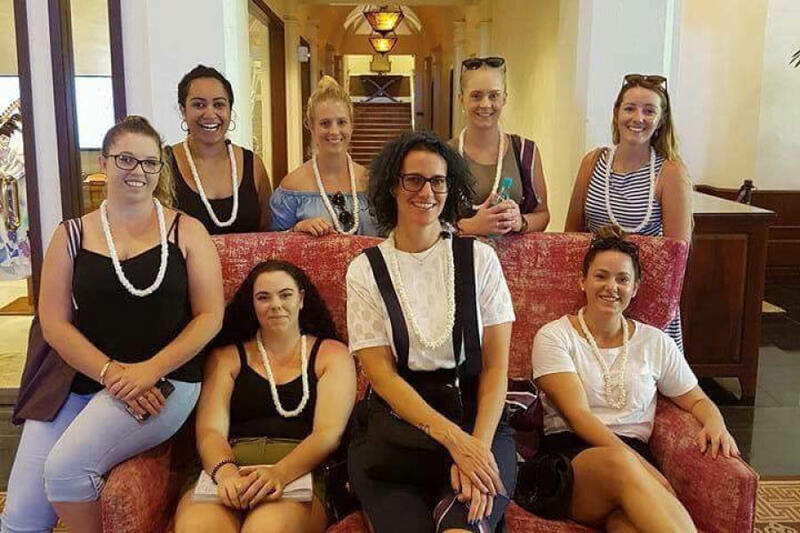 Keen to see what was new in the Aloha State, the team flew Hawaiian Airlines and prepared for 4 nights of meetings, explorations and a bit of fun! They’ve returned to us fresh, revived and still completely in love with Hawaii—even more so than before, if that’s even possible! 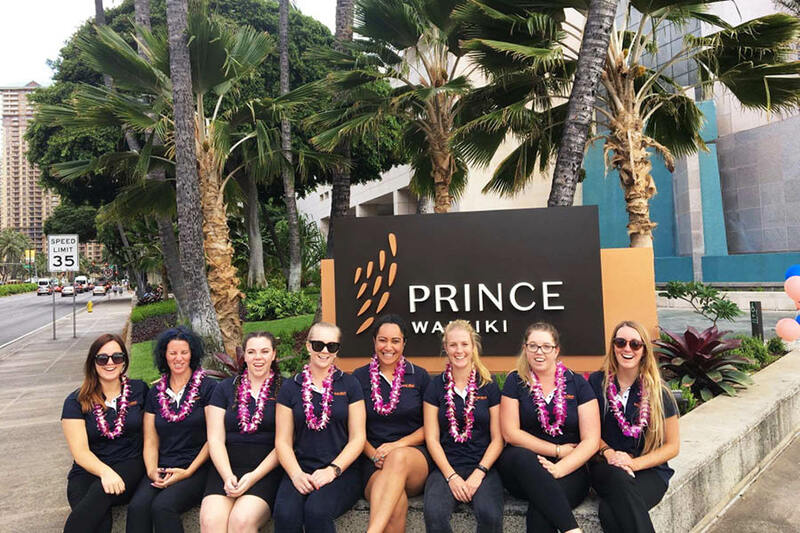 Our Hawaii Holiday Experts spread their time across the Prince Waikiki, the Hyatt Regency Waikiki Beach Resort & Spa and the Moana Surfrider, A Westin Resort & Spa. There were able to fit in 12 resort inspections, the Hidden Gems of Oahu Tour, meals at a range of My Hawaii preferred restaurants and cafés and a luau at The Royal Hawaiian Resort. No great Hawaii trip would be complete without a stop in a some of the shops and a bit of R&R by the pool and at the beach, so our Hawaii Holiday Experts graciously factored in some time for that too (just to make sure they were experiencing it right)! 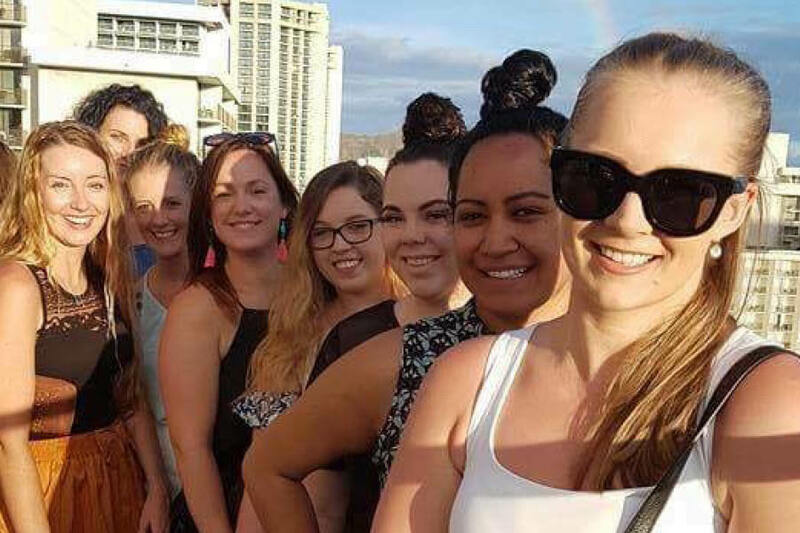 Keep reading below to find out more about this amazing Hawaii trip. The team returned home with fresh tips, must-dos and top resort picks and we’ve collated them all just for you! 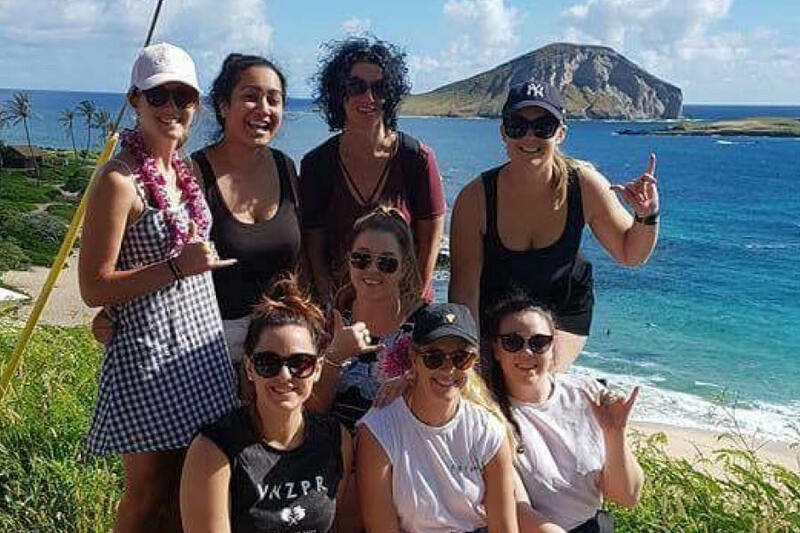 Chloe is a seasoned Hawaii traveller and that’s exactly what you’d want in a My Hawaii team leader! Her passion for the Aloha State shows not only in the amount of times she’s travelled there herself, but in the way she talks about the destination. Her descriptions are filled with love and you can’t help but let your mind drift away to the islands as she speaks. She loves sitting at the restaurants and bars across each of the islands, enjoying a cocktail while she overlooks the stunning blue ocean. The live bands and sound of the lapping waves are, to her, so magical and, honestly, the rest of us totally agree with her! 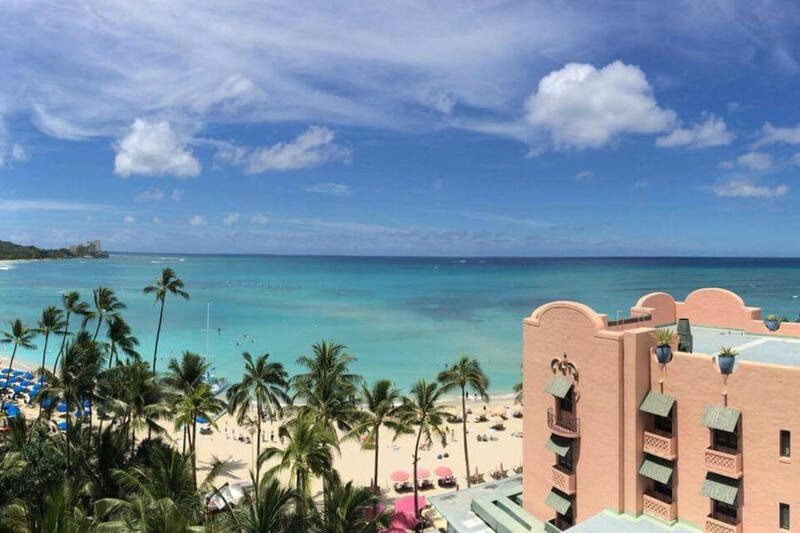 This time around, The Royal Hawaiian Resort stole Chloe’s heart—the view from the rooms in the Mailani Tower were gorgeous and the continental breakfast and nightly drinks were pretty hard to beat! She also enjoyed the views from the Leahi Club on the 30th floor of the Sheraton Waikiki Hotel! Chloe was surprised by the peacefulness of the Prince Waikiki—located just a short distance from the bustling Waikiki Beach hub, it was both connected and relaxing, free from the hustle and bustle! Chloe is already planning to go back to Hawaii in November and, while there, she’ll definitely stop in for another one of Dukes Waikiki’s famous Hula Pies and maybe even a Fish Taco. The amazing seafood platter at the Hyatt Regency Waikiki’s Japengo will no doubt tempt her again, as will the pull of a sunset hike up Diamond Head. Don’t pack too much, you’ll end up with so much shopping to bring home! Ashlee is a surfing nut so Hawaii has always been on her bucket list. The fact that there are waves to suit both beginners and professionals made the Aloha State extremely appealing to her and this recent trip did not disappoint! Ashlee’s main memory from Hawaii was the water. Whether it was the view of the Pacific from the top of Diamond Head, the way the hotels lined the shore or the actual feel of the water as she rode the waves, it was all great to her! Best of all was the way the Outrigger Waikiki Beach Resort backed onto the beach—direct access to make the most of the waves! Out of the 12 resorts she saw, the Outrigger was Ashlee’s favourite. It was both peaceful and conveniently located, plus the rooms were huge and had amazing views! Her favourite meal was at Japengo. 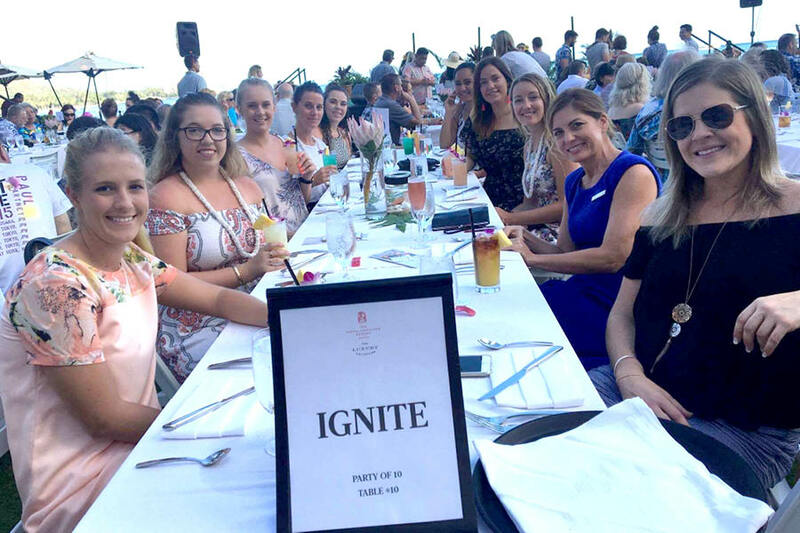 Much like Chloe, the spread put on by this Hyatt Regency Waikiki Beach Resort & Spa really blew Ashlee away and she’d definitely go back again! Everyone in Hawaii was extremely friendly and she enjoyed exploring all the key sites around Waikiki on the team’s tour. Take sunscreen, the heat is strong! Nicky has lived in Hawaii so travelling there with the other Hawaii Holiday Experts was like returning home! She was surprised to see that, since she’d left, the International Marketplace had been finished, despite the laid back attitude of ‘Island Time’! Nicky enjoy exploring the Aloha State’s newest shopping destination with her team but what really made the trip for her was Waikiki Beach. Waking up early for a quiet stroll along the beach, surfing there and hiking up Diamond Head to view it from afar are all must-dos in her books, along with a bunch of other great hiking adventures! In Nicky’s opinion, hiking in Hawaii is an absolute must! Whether up Diamond Head, along trails outside of Waikiki, or to the Manoa or Waimao Falls, there is so much to do, see and experience when you explore Hawaii on foot! Wherever you travel in Hawaii, you’ll encounter beautiful Hawaiian people and culture and, hiking or not, they will all treat you like ohana (family). Nicky’s favourite resort during the trip was the Prince Waikiki. She found the rooms spacious and luxurious and the short distance to the Ala Moana Shopping Centre held a definite appeal! Many foods enhanced Nicky’s time in Hawaii with the team. The traditional pig cooked in an imu (underground oven) was amazing and the omelette station at Duke’s buffet breakfast was so delicious. Pack light because you can buy everything there for an incredible price! Take old running shoes. Hikes can get pretty muddy! Hawaii to Cristiana was all about shopping, sampling cocktails by the beach and shopping (did we already mention that!?). She enjoyed the drive along the coast at the North Shore too. Watching the waves crash toward the sand on one side, while being surrounded by lush greenery on the other was truly incredible! Hawaii, Cristiana discovered, is a place for everybody. There’s so much to do across each of the islands and she can’t wait to go back to see it all again with her son! Cristiana’s favourite resort during the trip was the Hyatt Regency Waikiki Beach Resort & Spa. The rooms were spacious and comfy, there’s a great coffee shop downstairs and they served up the best buffet breakfast in the whole of Waikiki! The Cheesecake Factory was also high up on her favourites-list, along with all the new tours she learnt about as the team explored! Pack light as you will be bringing plenty back! Morgan was blown away by the culture and friendly nature of the people in Hawaii. It seemed that everyone wanted to help out and, whether that was in the hope of a tip or just because they wanted to, it really felt nice to have people eager to go the extra mile! The beach views, sunshine, outlet shopping and amazing restaurants and bars earned a solid 10/10 from her and she would definitely recommend a bit of time out from exploring to relax by the poolside with a cocktail in hand! The Aha’ Luau at The Royal Hawaiian made Morgan feel like she was on a small tropical island. The bustle of Waikiki city seemed to drop away and she could just enjoy the traditional entertainment, food and culture! The Mailani Tower rooms at the same resort really surprised Morgan. The space within each room was more than she had expected and the overall vibe from the resort was one of tranquillity and serenity. Hyatt Regency Waikiki Beach Resort & Spa served up the best meal of the trip in Morgan’s books. Japengo restaurant’s degustation was delightful, with heaps of fresh seafood, smoked chicken and delicious corn! Rebecca could not believe the sheer amount of things to see in Hawaii! From the bustling hub of Waikiki Beach to the beautiful North Shore and all of the sites, restaurants, shops and bars in between! Her top activity on the trip was snorkelling in the Aloha State’s beautiful clear waters and hanging out with all of the honu (turtles). The team did a snorkel/turtle spotting trip while over at Oahu’s North Shore, followed by a Shrimp Truck lunch and tours around a macadamia farm and the Dole Pineapple Plantation. The Royal Hawaiian was Rebecca’s top pick of the resorts. She found it very romantic, with lots of space to relax—the ultimate luxury! Duke’s Barefoot Bar served up her favourite meal, at the Outrigger Waikiki Beach Resort. The whole place gave off the ultimate authentic Hawaiian vibe and the Korean Street Tacos were the bomb! Rebecca already has her next trip to Hawaii planned and booked. The friendly people, great food and drinks and incredible weather influenced her to go there to escape August’s winter! Don’t bring too many shoes—thongs and some sandals will suffice and can last the transition from beach to bar! Check out the view from the Leahi Club at the Sheraton Waikiki Hotel. 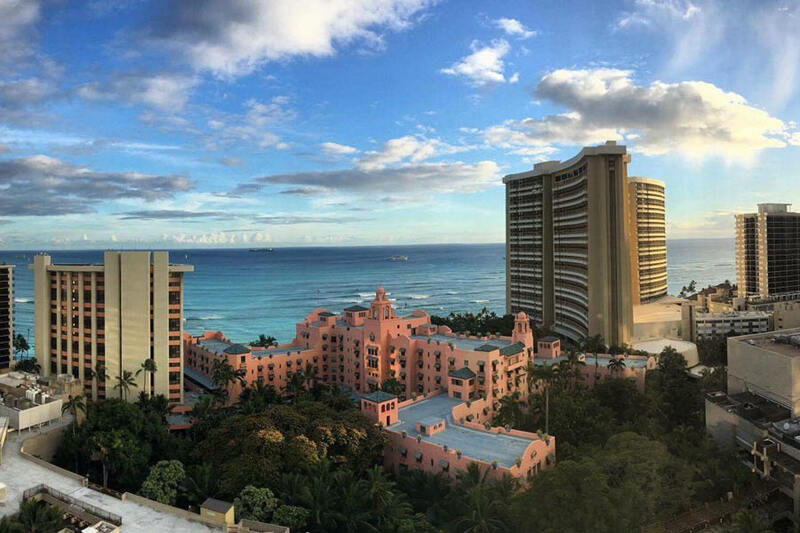 You won’t get a better look out over both Waikiki Beach and Diamond Head! Alyssa filled her time in Hawaii with early morning walks and incredible adventures. Hiking up Diamond Head was her favourite thing to do—seeing the city before it awoke was really special and the lighting as the sunrise met the mountains was breathtaking! A close second was surfing in the clear blue waters of the Pacific Ocean. She did most of this at Oahu’s North Shore and she’d love to go back and do a bit more! The Prince Waikiki completely exceeded Alyssa’s expectations. The rooms were huge and the resort was set up so nicely, with heaps of modern facilities and features! The views there were also one in a million. Views from the Diamond Head lookout and the Hyatt Regency Waikiki Beach Resort & Spa’s Ocean Front View room followed close behind those at the Prince Waikiki and Alyssa also enjoyed the historic feel at The Royal Hawaiian resort. Alyssa would highly recommend all Hawaii travellers to explore the islands to their fullest and go on at least of of the Aloha State’s incredible hikes. The range of options and value for money at the Cheesecake Factory is also something not to be missed! Pack only the essentials. Everything else, you can buy there! Prepare to be welcomed—everyone in Hawaii is super nice and laid back! The Royal Hawaiian resort held the greatest appeal to Sarah throughout the Hawaii trip. The Luau their was a really great experience and she found it truly incredible to be welcomed into the traditional Hawaiian culture. Her favourite view was from the top of Diamond Head. Hiking up there with the other Hawaii Holiday Experts was a breathtaking experience; a great way to get an overview of Waikiki! Sarah found everyone in Hawaii to be extremely welcoming. 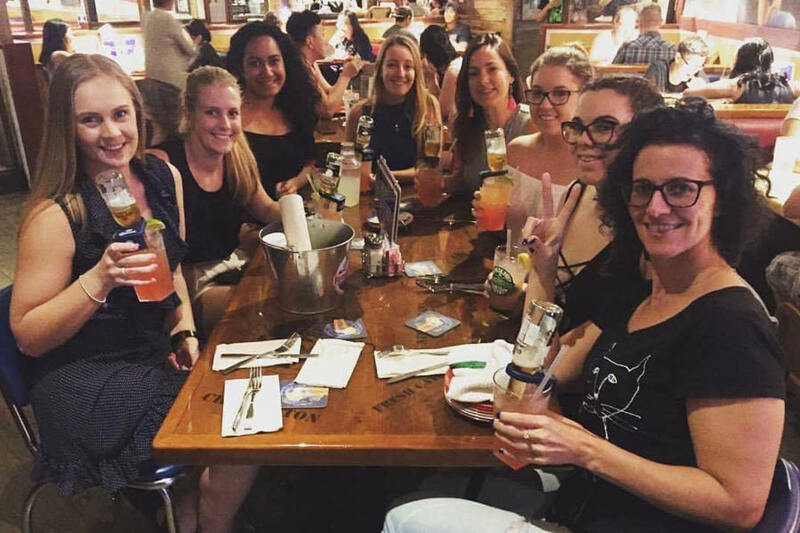 Wherever the team went, they were welcomed by all and it left a lasting impression on her and the other Hawaii Holiday Experts! Sarah’s favourite meal was at Duke’s Barefoot Bar at the Outrigger Waikiki Beach Resort. The Cookie Dough Hula Pie was incredible and she’d recommend it to everyone! Although she knows that the team fit in so much during their stay, Sarah wants to go back to see and do even more. Hawaii, to her, is not just a once-off destination—there’s so much to fit in! Contact our Hawaii Holiday Experts to learn more about the Aloha State!